Confederate flag sales: Up, still racist. 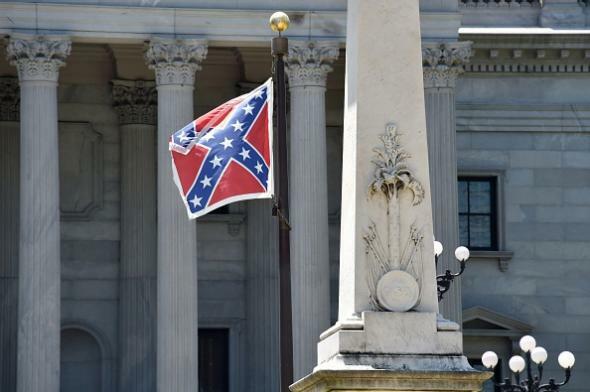 The Confederate flag outside South Carolina’s statehouse in Columbia. On Monday, before Haley announced her change in position on the flag (which still must be approved by the state assembly), Amazon listed two Confederate flags among the 60 bestselling items under “Outdoor Flags and Banners”: one at the No. 5 spot, and one at No. 43. The following morning, five of the top 20 bestsellers in the category were Confederate flags, including the No. 1 bestseller, a 3-by-5 foot polyester model made by Rhode Island Novelty and sold by a company called Anley. Among the top 60, 12 were versions of the Confederate flag. A small Nevada company told Yahoo’s reporter it sells five Confederate flags in the typical week and has sold nearly 250 this week. The article also notes that many such flags are actually manufactured in China, which means that (at least in the short term) a controversy related to the United States’$2 19th-century civil war is enriching the capitalists who work within the communist system of one of the United States’ longtime 21st-century antagonists. We live in strange times.